At Fingerprinting Express, we feel that nursing is one of the most impactful careers out there. Good nurses help save lives and touch the hearts of patients and their families every day, even while working in the most high-stress, demanding conditions. Because of the importance and nature of the job, nurses must adhere to strict guidelines, stay current on licensure and training, and undergo regular fingerprinting background checks for the safety of the public. Whether you are considering becoming a nurse in Nevada, are an experienced licensed nurse needing to renew a license, or work as a traveling nurse, this post will help you understand the steps needed to get your licensure and stay current. According to the National Nursing Database, there are currently around 4,130 Licensed Practical Nurses (LPNs) and 42,029 Registered Nurses (RNs) in Nevada. If you have a passion for helping people in a medical setting, nursing can be a rewarding and well-paying career. The average LPN in Nevada makes around $55,000, and an RN earns around $84,980 per year (annual mean wage). Salaries vary depending on where you work and your level of experience. Nevada is working to raise its status in the healthcare industry. There are several scholarships and grants providing assistance toward Nursing education in efforts to increase the amount of healthcare professionals in Nevada. It has been estimated as of 2017, that Nevada needed over 5,500 licensed nurses just to catch up to National average. According to University of Nevada Reno’s Health Workforce Supply in Nevada Policy Report, Nevada ranks 48th in registered nurses for our population. Thankfully, Nevada has organizations like HEALS Las Vegas that are working hard to change the Nevada Healthcare Industry rankings, including Nevada’s registered nurses. In addition to the settings listed above, there is a high demand for nurses that are willing to travel. Traveling nurses go to different locations on a short-term basis (typically 8-26 weeks) depending on the assignment. Perks include great benefits and pay, housing compensation, flexibility, and the excitement of working with world-class doctors in various facilities. If you like to travel and enjoy the variety of different environments, this may be the perfect position for you! Learn more about requirements for obtaining a traveling nursing position in Nevada here. Whether you are applying for your LPN or RN licensure, there are a number of steps you will need to take in order to obtain your nursing license. First, you will need to complete an approved nursing program in Nevada. The Nevada State Board of Nursing has given its full approval to certain schools to instruct Nevada nurses in all aspects of their pre-licensure nursing programs. Some of these educational facilities include the University of Nevada Las Vegas (UNLV); the University of Nevada, Reno (UNR) Orvis School of Nursing; Las Vegas College; and several others. See the complete list here. Next, you will need to register for and pass the National Council Licensure Examination (NCLEX). LPNs take the NCLEX-PN and RNs sit for the NCLEX-RN. Here are some additional details on the application and registration process for the NCLEX. Once an individual has competed an approved program and passed the national licensing examination, RNs and LPNs are encouraged to apply for licensure through the Nevada Nurse Portal, a secure and confidential cloud-based system that allows nurses to apply for, renew, and access information related to their license or certificate status from one convenient place. To get started you will need to access the Nevada State Board of Nursing Nurse Portal, create an account, follow the instructions to complete the application, and then submit it when finished. You will be required to undergo a fingerprinting background check to determine eligibility for licensure during this process. Complete the application form, including applicable license/fingerprinting fees. Include evidence of graduation from a qualifying nursing education program. Provide official verification (or endorsement) from the state where you were originally licensed. When you begin the endorsement process, you will receive a temporary permit while waiting for the results of the background check. The Board recommends having fingerprints done as soon as possible since it can take up to four months to get the results. Contact the Nevada State Board of Nursing for details on the RN/LPN Endorsement application process. If you’ve graduated from an international program, you can be licensed in Nevada if the program you completed meets Nevada’s legal requirements. To accomplish this, you will send your credentials, including professional licenses and nursing education, to be reviewed and evaluated by the Commission on Graduates of Foreign Nursing Schools. Additionally, if you have graduated from a program where English is the not the primary language, you will have to pass an English proficiency exam. Fingerprints and a background check will also be required as a part of the process. Learn more about the steps needed here. In addition, RNs and LPNs must complete a one-time, four-hour bioterrorism course in accordance with the Nurse Practice Act. *Note: NSBN works with Nursys e-Notify, a free notification service that will send automatic email and SMS updates to help you stay current on your information related to your licensure. You can sign up for this handy tool to receive reminders of your license expiration, updates on the status of your license, and other pertinent information regarding your license. Naturally, nurses have many questions about fingerprinting and requirements from the Nevada State Board of Nursing. Here are some answers to commonly asked questions. Q: How often do nurses need to undergo background checks? A: The NSBN made fingerprinting mandatory for all initial applications as of 1/1/2000. Fingerprinting became a requirement for licensure/certificate renewals as of 10/1/2010. If your initial license was issued five years ago, you will need to submit fingerprints. The Board requires all applicants for renewal to undergo criminal background checks every five years (or as directed). Q: How do I know when I need to be fingerprinted? A: Fingerprinting is required for initial licensure. Upon renewal, you should receive a notification letter outlining your need for fingerprints when the Board receives your renewal application (for paper and online renewals). Q: Will my criminal conviction keep me from a nursing career in Nevada? A: Not all criminal convictions will keep you from obtaining/renewing a nursing license. Click here to see what the NSBN has to say about criminal convictions. It is important to be honest when answering questions on your initial licensure/renewal applications. If you answer “no” to a question and then you are found to have a conviction, your application will be considered fraudulent and it will be denied. Q: Should I get fingerprinting done prior to renewing my license? A: No need, but you are urged to have it done as soon as possible after receiving notification from the Board that it is needed for renewal. Livescan is the fastest way to process, if you are submitting hard fingerprint cards it is recommended you mail them in at least 5 months beforethe expiration of your license. Q: If I recently had fingerprints done in another state, can I use those? A: No. You will need to submit a new set of fingerprints to the Board as FBI regulations do not allow sharing of criminal history reports. Q: Do I need to get my fingerprinting done at the Nevada Nursing Board office? A: No. However, you do need to have your fingerprints done by any authorized fingerprinting vendor to submit your fingerprints. The Board strongly encourages having your fingerprints collected at a facility that uses electronic submission. If you are out of state you will mail in hard fingerprint cards. Fingerprinting Express accepts walk-ins 6 days a week. Q: How long will it take for the Board to receive my fingerprint report? A: Livescan electronic submission is the fastest way to process. By Nevada law, NDPS must send the results within 30 days. Fingerprinting Express has produced results as soon as 5 days. Hard cards can take from two to sixmonths to get the results, so it is recommended that you have your fingerprints done as soon as possible after you receive notification that they are needed. Please note, it will take the board longer to license you after they receive your criminal history report. Q: What if my fingerprints are rejected? Does that mean a criminal conviction has been found? A: Not necessarily. This is not unusual and can happen for several reasons. Sometimes it is a poor-quality print due to operator error or inexperience. Having Livescan fingerprinting done virtually eliminates these types of errors. Other times it is because nurses (especially those who have been in the field for years) may have worn down fingerprints. There are temporary reasons fingerprint ridge detail is not capturing. This is why the State and FBI will request another set of fingerprints to see if better ridge detail can be captured on a different day. You cannot submit the same fingerprints twice. If you require ink fingerprints, it is best to go with a highly-rated fingerprinting facility for the best results. Q: Sometimes I have to be fingerprinted twice in one visit. Why is that? A: This typically happens when both the employer and the Board require fingerprints. For legal reasons, each set of fingerprints requires a separate submission. Fingerprint facilities must put the lawful reason for fingerprinting on the record. These lawful reasons are different for licensing and employment. This is usually the case with nurses working in long-term, elderly or disability care. At Fingerprinting Express, we are proud to offer four convenient locations to provide the best fingerprinting services to Nevada’s nurses. We do our best the first time to prevent rejections – we have the lowest rejection rates at .002% (industry average is 1% rejection rates). We use high-resolution technology and have special techniques to get the best possible fingerprints the first time. Our clean, modern facilities and friendly, expert staff ensure that you have a fast and pleasant experience. An approved vendor by the Nevada Nursing Board, we offer traditional hard cards and Livescan fingerprinting which can be submitted electronically. 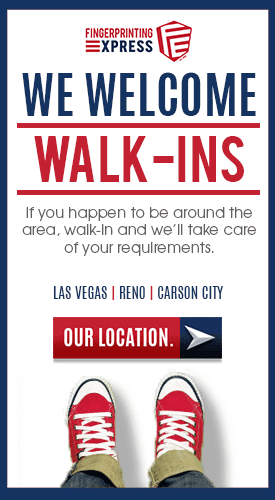 Get in touch with us today to schedule an appointment or walk into any of our locations at your convenience. If you are a nurse in need of fingerprinting for licensure or renewal, you can count on Fingerprinting Express! Call today with any questions or to schedule your appointment at 1-800-919-0227 or walk in when it is most convenient for you. Click here to find a store near you.